And also - Wednesday Comics! There seems to have been a tremendous response to the book out there, which is great to see. Mark Chiarello is a total genius. I'm eternally grateful to him for including me in this amazing book. More previews to follow. Be on the lookout for issue 2 of Wednesday Comics this week! Holy Crap, Joe — That's awesome (both the opportunity and the artwork)! Haven't picked up Wednesday's Comics yet, but I plan too. Looks so good! I notice that some of the panels were resized - I'd love to know why and how? Wednesday Comics is so much fun! 3 more sleeps! Actually ALL of the panels were resized. At a certain point, the DC higher ups decided that the original intended format for the book of 16 by 20 would be reformatted to 14 by 20 to cut costs. The change doesn't sound like much, but it really does change the proportions of the page a good deal. 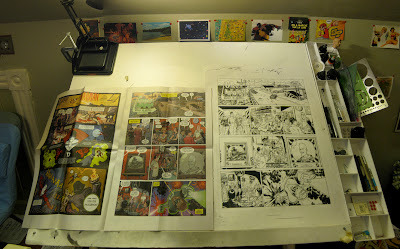 By then I'd already completed a couple pages at the original dimensions. And with the reformat, just resizing the page down to fit left a large gap at the bottom. So, with tracing paper I went in by hand and added more space to the tops and bottoms of all the panels, then blended it in the computer. This way it fit perfectly into it's new format. Whew! inspiring stuff! thx for posting! I've been looking forward to Wednesday comics not only to see how this comics experiment was going to work and what people thought of it but also to see more work by Gaiman and Allred, Paul Pope and especially you Joe. Your page looks wonderful and even though I've never read any Green Lantern, I'll be buying all the other Wednesday Comics just for your story. And if that wasn't enough praise, your Madman pinup is beautiful. I've been a Madman and Allred fan for a long time and I've seen lots of the pinups but this may be my favourite. You've captured all the characters perfectly. You are on a roll, Joe Quinones! stunning work! will u be selling prints of this? great job all around on Wednesday comics. I was curious about what sizes folks original were, I would have thought they'd be a lot bigger than the one you show here,hmmn. Amazing work1 I just found out about your work via Twitter and am glad i hopped over. I'll be back for lots more inspiration. By the way, I like your taste in postcards.